February 2, 2019 This story has been updated with further comment from Warhammer: Chaosbane’s game director. Once upon a time, Warhammer games were pretty uncommon. Since 2014, there’s been a flood of them, and while some of those games are good, they’re not all up to the standards of titles like Total War: Warhammer 2. It remains to be seen which side of the line Chaosbane falls on – we are, as always, hopeful for one in the ‘good’ column – but the developers at Eko Software tell us that Games Workshop is aware of the reputation Warhammer games have gotten, and the company is trying to change it. 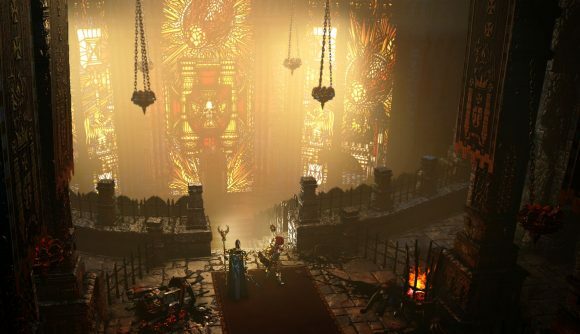 We saw a bit more of Chaosbane with some Dwarf Slayer gameplay, and so far it seems that this take on Warhammer is shaping up well. Hopefully it signals a broader move for the Warhammer license to be handled with more care going forward. Update: Chaosbane game director Jean-Georges Levieux has been in touch to add to his comments. His statement follows in full. “Some of the quotes from this article may be confusing and suggest that EKO Studio and Bigben are downplaying the work of other studios working with the Warhammer license, or that some ages within the lore are less appealing. “We wanted to assure PCGamesN readers this was not our intention. We respect and understand the amount of hard work and passion that goes into creating games based on the rich Warhammer universe.